Here’s a bunch of random pictures in which I chronicled our doings for the week. 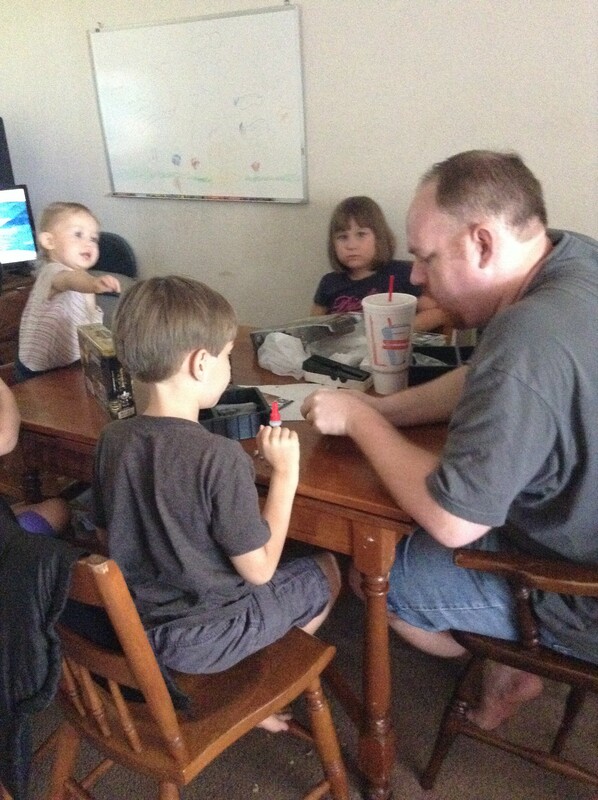 Daddy teaches the kids the basics of War Machine. Assembling and painting the mini models has been a great art project. 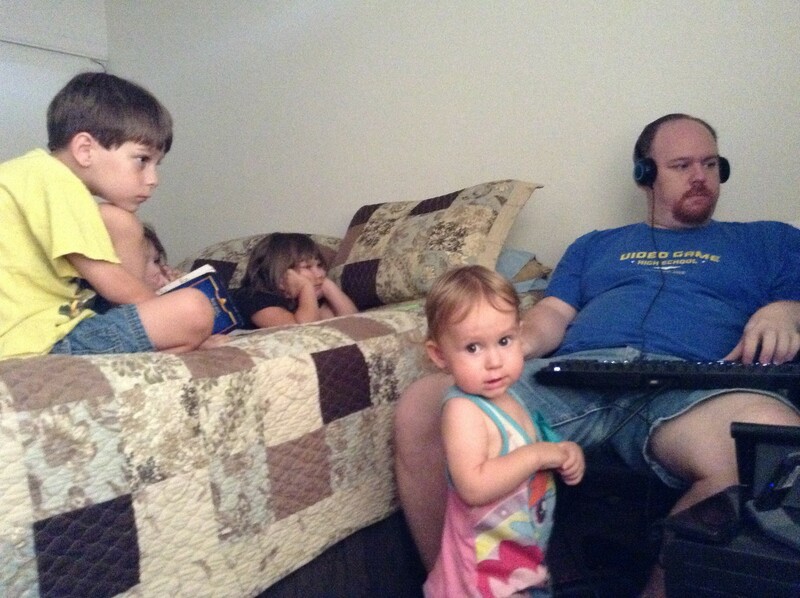 Everybody watches Daddy play Final Fantasy 14. 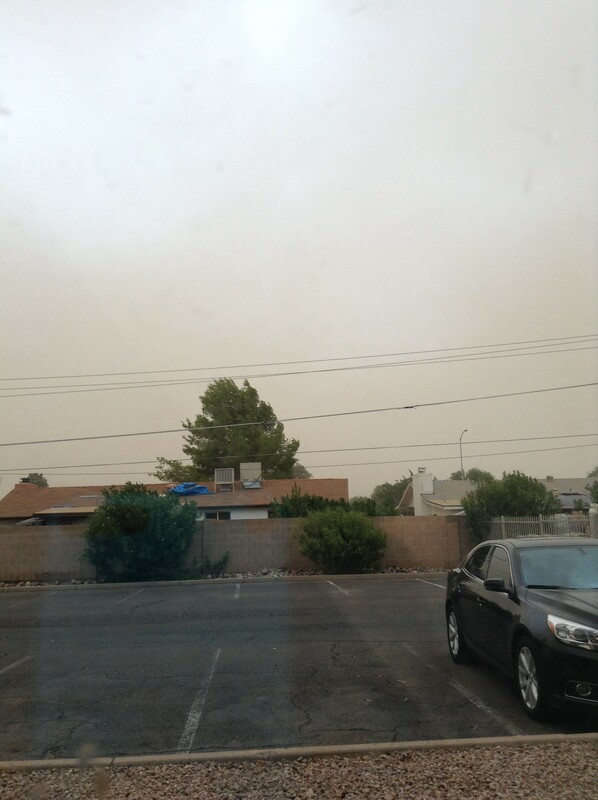 A giant dust storm hit us shortly before a giant thunderstorm–one in the morning, and a bigger one that night. It was glorious. 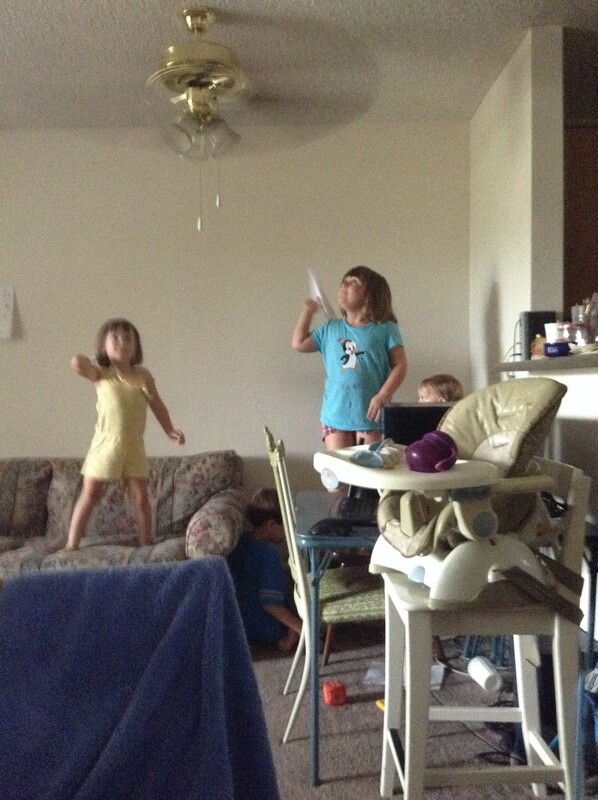 A fun after-school activity–Throw The Paper Airplanes Into the Ceiling Fan. As you can see, a nice, busy week. I didn’t get any pictures of us doing school, but believe me, school was done. My oldest daughter has decided that dictation is her favorite subject, while my son has taken to multiplication without protest. This morning, all of us were awakened out of a sound sleep by a crack of thunder like a gunshot. No rain, just loud snarly thunder. It remained cloudy all morning with various rumbles of thunder. 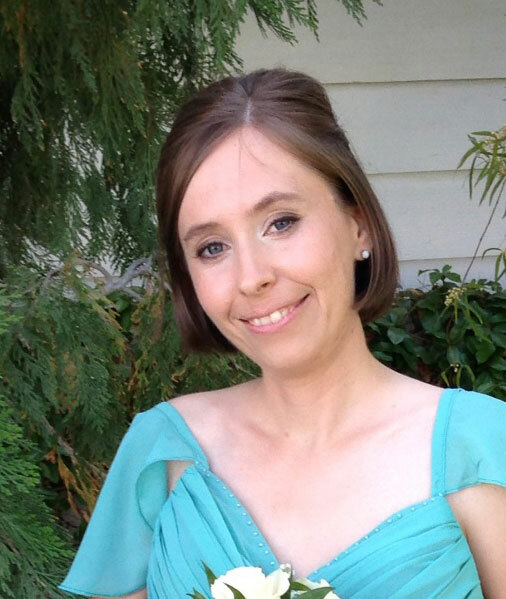 I did school with the kids, then decided to take the trash out. I had taken the toddler with me. Imagine our surprise, when halfway to the dumpster, the heavens opened and it began to pour! Big drops, coming fast. By the time we got to the dumpster and ran back, she and I were drenched. 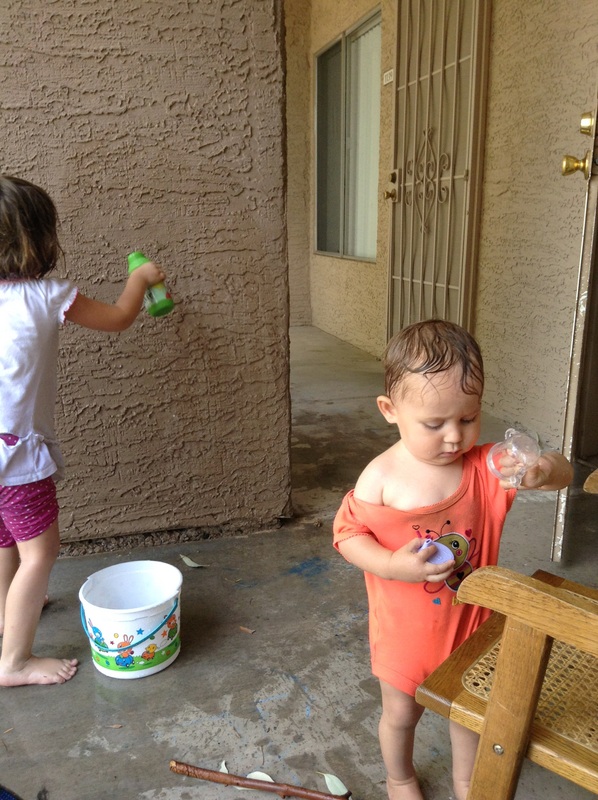 She thought it was the greatest fun ever, and stayed outside to play in the water. 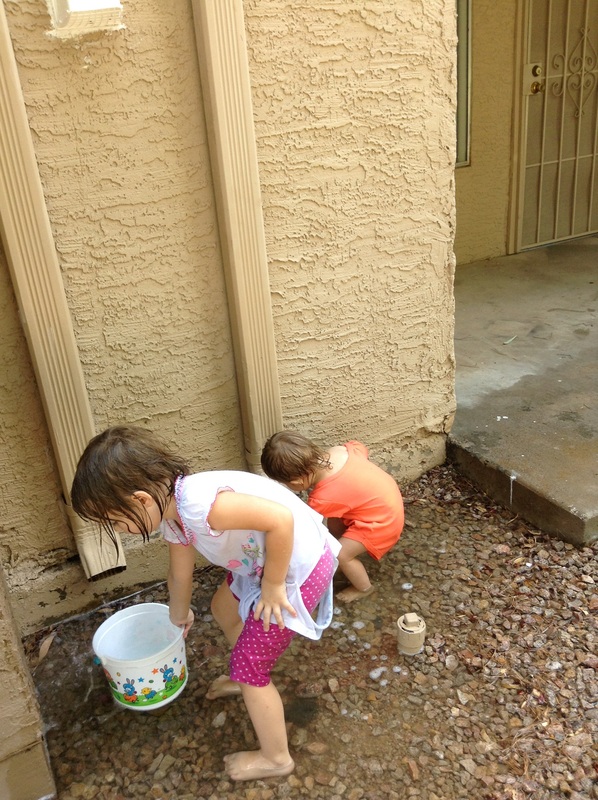 Here they are catching water from the rain gutters, which transformed into miniature waterfalls. 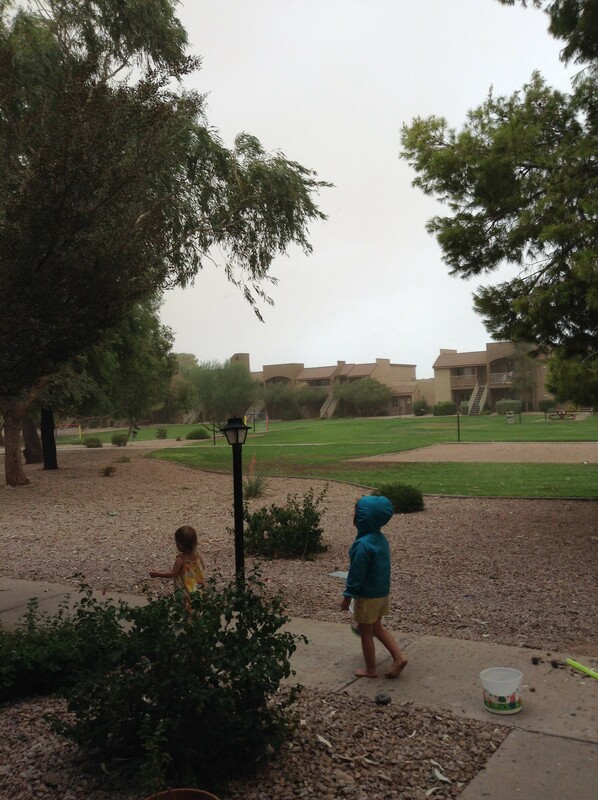 The tree by our apartment was full of grackles and goldfinches who were all taking showers. Singing, happy birds, flicking their tails and fluttering their wings, hopping everywhere to catch more drops. Makes for an exciting, outdoors kind of morning! There’s no pictures in this post, because, trust me, you don’t want to see the horrors I saw. Our apartment has a cockroach problem. Oh, they’re the little German roaches, so it’s not like I have four-inch monsters climbing my walls or anything. I’ve sprayed, put down diatomaceous earth, left bait traps, everything. They’re breeding under the dishwasher, and I can’t get to them. So I clean house as best as I can and leave it at that. Anyway, the past month or so, we’ve had a lot of fruit flies around. I always have piles of fruit on my counter for the kids to snack on, so I figured that was the source. The thing is, the fruit is completely gone by the end of every week, so I couldn’t tell where, exactly, they were coming from. Then there was the smell. I’d been battling this sewer-smell for weeks–I cleaned and cleaned and cleaned, and it never seemed to go away. I cleaned my trash can and scoured the fridge for stinky leftovers, and anything else I could think of. Nothing helped. I started pulling stuff out from under my sink in preparation for cleaning. Among the various odds and ends under there, I had a mop bucket that I use mainly for storing cleaners. It had an inch of black water in it. In the water were piles of roach corpses, and hundreds of fruit fly larvae. Thousands. The source of the mysterious smell had at last been uncovered. Down the toilet the water went. I scrubbed and swept and stomped survivors, and threw away just about everything. By the end, I just wanted to throw up. Or scream and run away. I took the kids to the park and sat out in the clean fresh air for a long time. 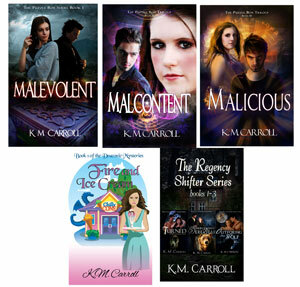 But as I recovered, it was with a growing sense of satisfaction. The insect population in our apartment is going to drop dramatically for a while. Also, I don’t know where that black water came from. Did my garbage disposal leak? I couldn’t get it to drip when I was under there cleaning. Either way, we have a problem I need to make sure gets fixed, pronto … I just have to figure out what in the world it is.